VINTAGE COSTUME ANTIQUE ESTATE JEWELRY EARRINGS! Spectacular Crystal Rhinestone Silvertone Vintage Estate Chandelier Dangle Drop Clip Earrings For Weddings, Proms, Pageants And Parties! 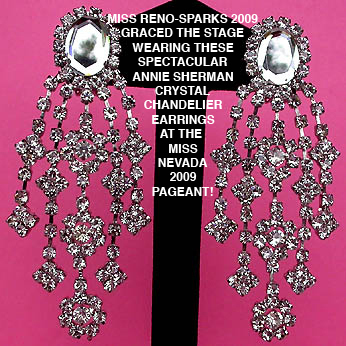 These magnificent clear crystal rhinestone vintage chandelier earrings are truly jaw dropping! The reflective faceted large 3/4" x 1/2" oval clear glass stone is surrounded by sparkling faceted clear round crystals with sprays of graduated rhinestone strands dripping down. Along the cascading strands are exquisite shimmering clear rhinestone rosettes adding even more beauty and grandeur. All the divine stones are pronged in shiny silvertone metal. New old stock from the 80's in mint condition. Fabulous earrings for weddings, proms, parties and special functions! US$188.00. 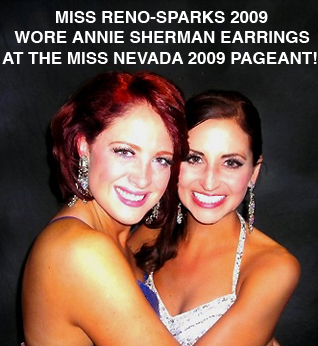 SOLD TO MISS RENO-SPARKS 2009 (3RD RUNNER UP TO MISS NEVADA 2009).